Posted on June 5, 2012 by Q. In Arcadian, the language spoken by Semitic inhabitants of Mesopotamia the name Qudistu/Qassatu/Qasdatu refers to a woman of special status. These woman lived on the street and the street was a place where residents not in ‘organised’ households met up. In the legal system of the time Qudistu were classed as women who did not live by societies standards, and therefore their sexuality was ‘un-regulated’. Household women were either married with a husband or celibate, living at home with their parents and their sexuality was regulated by family or husband. being tied in this way they lived under the patriarchal system of the times, unable to own property and accountable to a male figure. The advantage for Qudistu was they were able to own their own property outright and also take on any employment they chose. They were the liberated women of their time. being liberated and not under a mans control the lives they lived were always surrounded by mystery and gossip. They were considered to be Witches and Sorceresses – bad women, who good decent (controlled women) only met up with at certain times, notably childbirth. Qudistu could work as Midwives, suckle babies who’s mothers had no milk, and adopt the children of women who died in childbirth. In the 3rd Millenium Sumerian became the most important language in the area for communicating between people and in trade. The Sumerian woman’s name for Qudistu was ‘Nu-gig’. This name also refers to the Goddesses Inanna, Aruni, Ninmah, Nanja, and Ninisina. They used these terms to describe ‘Sacred Prostitutes’, and ‘Hierodule’ – the ‘Religion of Sacred Prostitution’. The street walker had by the change of language, also changed her status to a higher rank, one to be adored rather than ostracised. 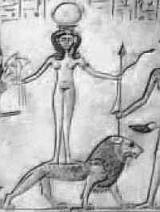 They existed in the Biblical worlds of Babylon, Israel and Judah until the 7th & 6th Century BC, still considered to be beneath married and celibate women, controlled women. As in Mesopatonia, they also gathered on the streets and congregated in Bars considered to be ‘brothels’, where decent women would never attend. In these establishments trade in business and property took place alongside the sacred worship. They were the Sacred Slave to the Goddess Qetesh-under her many names and forms. Ninisina – fittingly praise yourself!! Posted in Qetesh and tagged holy one, midwife, qudistu, sacred. Bookmark the permalink.